I was born in Elkhorn. Raised in Williams Bay. Then I lived in Linn Township, Geneva Township, Delavan Township, Fontana, and now Walworth Township. I am the embodiment of local. The word was made for me. If I’m not a local here, no one is a local anywhere. I was in France last week, being a non-local. If not for my strapping American frame and my obvious American nature, I might, after some lengthy period of time, be considered, at least by some, as a local. This business of localness typically requires significant effort and significant time. Last Friday night I walked in to the South Shore Bar and Grill on Delavan’s southern shore, feeling very much not like a local. I’ve been to this bar before, or I should say, at least once before. I went with a friend for pizza on a night when our wives weren’t looking. On that night, I generally enjoyed the pizza, which is tavern style. But on this night, I was there for the fish fry, and the parking lot sign proclaimed that I was indeed at the right place. I should say that I didn’t intend to visit the South Shore Bar that night. I first went to the Rushing Waters Trout House restaurant in Delavan. The restaurant there is very large, and when we walked in we were delighted to see open tables and no one waiting. The hostess told us there would be a 20-30 minute wait. But there were open tables, I replied, incredulous in my tone. She said there weren’t enough servers. And so we left. This is embarrassing for the Trout House, and if I were in any position of authority there I’d quickly right my ship before all of this excess water sinks it. The South Shore Bar and Grill is a bar. There’s a large bar in the main room, with a small dining room off to the West side. When we arrived the parking lot was full and so was the restaurant. We were told the wait would be maybe 10 minutes, so we stood by the door, sticking out like very sore thumbs. Eyes glanced our direction. At least one man at the bar whispered something to another man at the bar. It might have been about my powder blue shorts, but I couldn’t be certain. A man on the other side of the bar drank from a tall can of Busch Light. His wife nursed a cocktail. Everyone knew each other, no one knew us. If it weren’t for the Wisconsin law, I’m guessing 40% of the bar would have been pulling on a heater. A polite but somewhat harried hostess led us to our booth. The booth cushion on the one side was torn open in many spots, so I opted for the other side. But the other side had very little breathing room, and the table was affixed to the wall, a condition I only realized after pushing and tugging at it for a while. I switched with my son and sat on the torn side. I reviewed my fishy options. All you can eat fried cod, $11.50. Baked cod dinner, $11.50. Pan Fried Walleye, $15.95. Fried Walleye, $15.95. Fried Perch Dinner, $15.95. These are fine options. Impressive really, for a small bar on the way to no-where, just around the corner from Nothing. The menu reflected a general understanding of the Wisconsin Fish Fry. All items were served with a side of potato and access to the small salad bar that resided in between the bar and the dining room. I asked the waitress what she recommended. The fried walleye was a bit bland for her taste. She loved the perch. I opted for the fried cod, with a piece of baked cod for good measure. The salad bar was modest. A few bowls of mayonnaise based salad of some variety, along with some lettuce, chopped onion and tomato, and shredded cheese. I could have used a few more accoutrements, but seeing as how I was at a bar for fish fry, I didn’t mind. If you wanted a salad bar, you should have gone to a salad restaurant. This was a fried food restaurant with a side of pizza, and I was content to nibble a bit of salad and wait for my fish. After a week of French food, my stomach was hankering for some classic Wisconsin fish fry. And the South Shore Bar didn’t disappoint. The fried cod came out, two pieces with my initial order, and it was delightful. The batter was well seasoned, and the fish was moist, sweet, and salty. I really loved it. The baked was a bit dry, but it was served with a small plastic tub of drawn butter, and that made everything better. There was a single slice of rye bread on my plate, which was awful as expected but it was buttered so how terrible could it really be? Give me liberty or give me death, but if you’re going to give me rye bread you should at least butter it for me. The two potato pancakes were nicely fried to a golden brown, and while they were a touch dry, they met the expectation of an average pancake. I quickly ate all of my food and asked for a few more pieces of fried cod, not because I was hungry but because I refuse to walk away from an all-you-can-eat dinner offering without ordering seconds. The cod was again delightful, even if my second piece was thicker and ended up being slightly undercooked. My wife said the tartar sauce was okay, and I found the applesauce to be delicious. It was served ice cold, and had immense flavor. It was, perhaps, my favorite applesauce to date. I enjoyed my dinner at the South Shore Bar and Grill. The waitress was sweet and attentive, the food above average for this tour. The fried cod was a real treat, as the seasoned batter elevated otherwise bland cod to a higher level. 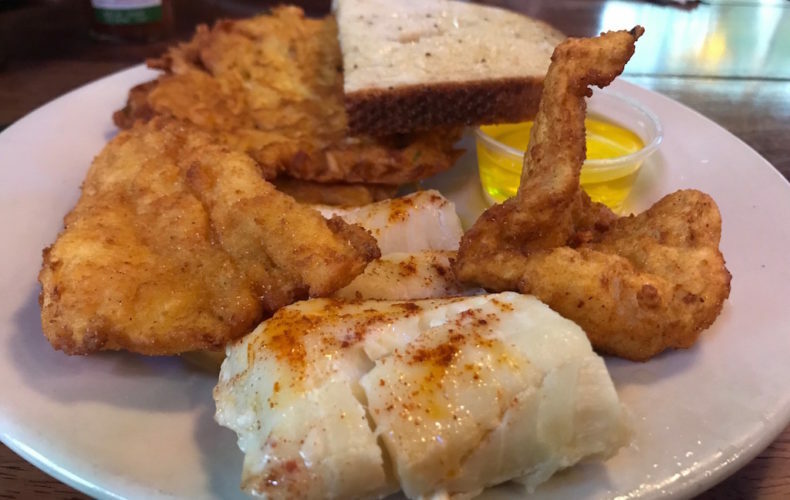 I’d add the South Shore Bar to your Fish Fry rotation, especially if your preferred joint is slammed this summer. I left feeling satisfied in my dinner, and had it not been for those powder blue shorts and my wife’s white jeans, we might have fit right in.